For Mother's Day, we made a SUPERDEEDUPER quick trip through Chicago. One of these days we'll have to get up there for a more extended visit, but this time work got in the way and it was not to be. We celebrated Mother's Day at the Parthenon in Greektown, which has been the site of lots of family gatherings since before I was born. Before Greektown, though, DJ, CB, Logan and I went out for Puerto Rican food. The plan had actually been to go to Hot Doug's, which had just announced that they'd be closing in the fall. This announcement, combined with a gorgeous May day, meant that the line was close to three hours long to get in. We waited an hour and then decided to pack it in and hunt down a jibarito. 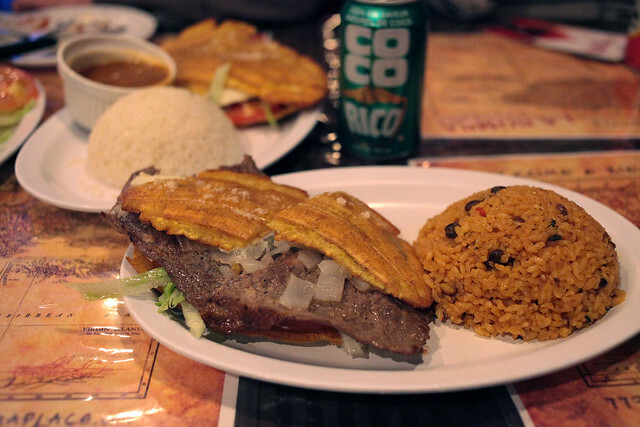 Jibaritos are a Chicago thing, created by the Puerto Rican community. I'd been wondering why I hadn't heard of these, despite growing up in Chicago, but the Wikipedia page tells me they weren't created until the late '90s. Jibaritos are sandwiches where the bread is replaced by a fried plantain! 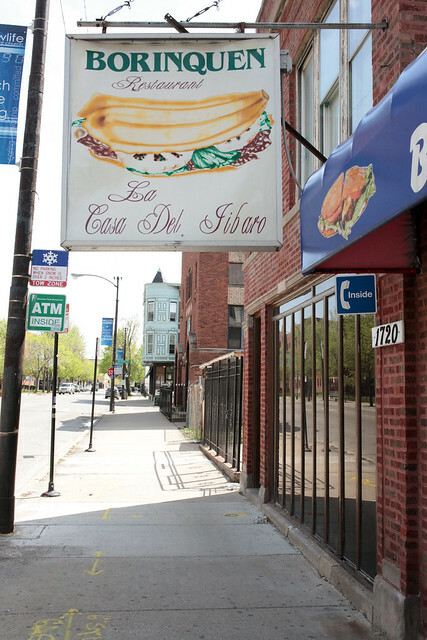 Borinquen was the original home of the jibarito, but they've unfortunately closed. So we went to La Bomba. We started with lots of fried and steamed appetizers, from banana dumplings to tamales, and washed them down with a variety of Caribbean sodas. 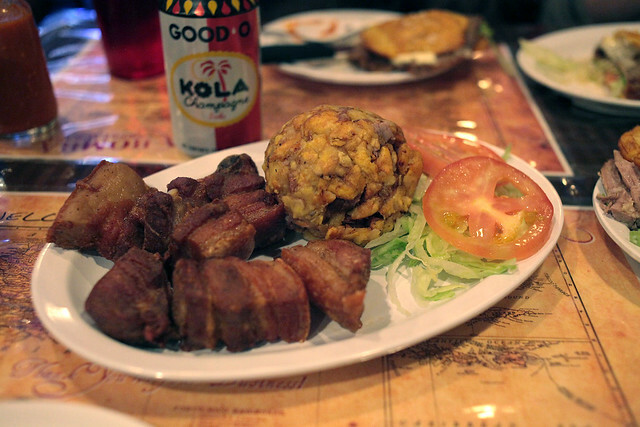 After that, we split an order of mofongo with fried pork. 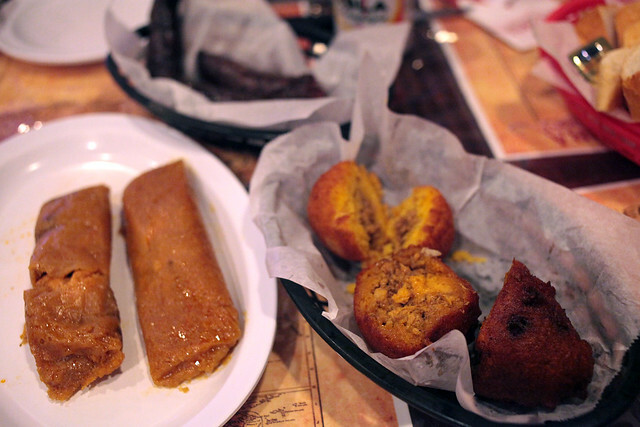 Mofongo is made from starchy green plantains, studded with meat, melded into a ball and... fried. Whoever was working the fryer in the back knows exactly what they're doing. And then, two jibaritos! The first, with stewed pork, was extremely rich. I preferred the steak and onion version. The steak had been pounded thin and fried, and the texture was pleasant with the slight crunch and starchy chew of the plantain. This meal was a lot of fun (though seriously heavy!) and it was a kick getting to try something completely new to us. If you find yourself in Chicago, I'd definitely recommend hunting one of these down. I've added this to my growing list of things I miss about Chicago. 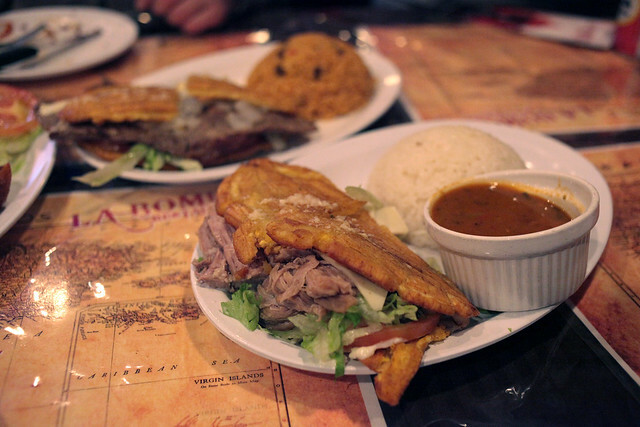 La Bomba is in Humboldt Park at 3221 W. Armitage. (773) 394-0106. Oh my glarb, you guys, we've been so sick here! The Mother of All Colds set up residence in Logan's lungs, and then jumped to mine after a week. Lo, the house has echoed these many days with the racking coughs of an unhappy couple. Basically, it's been disgusting here for, like, three weeks, and we are SO ready to be DONE. 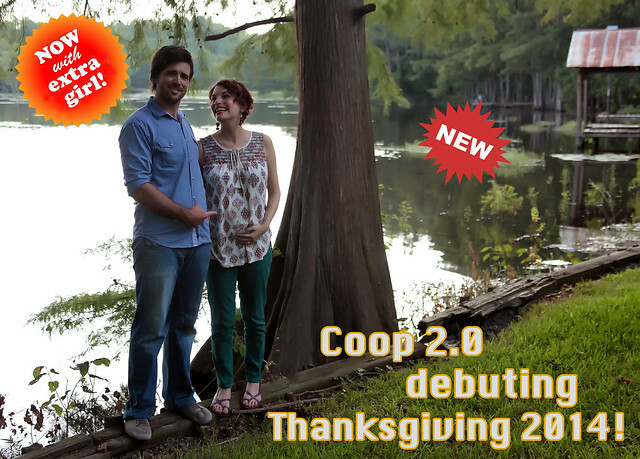 A couple of weekends ago, we were really feeling something comforting. And the dish we find most comforting on the weekends is Hot Breads' pesarattu upma. Hot Bread's version is a dosa, or Indian crepe, made from a green lentil batter and filled with upma. I think of upma as Indian cream of wheat. It's a thick porridge of semolina (usually, though in Mumbai our sweet hostess made us one with oats), usually flavored with curry leaves and/or peppers and/or mustard seeds, with a few small lentils and maybe a cashew or two thrown in for flavor. The pesarattu upma is served with a couple of chutneys and a sambhar. 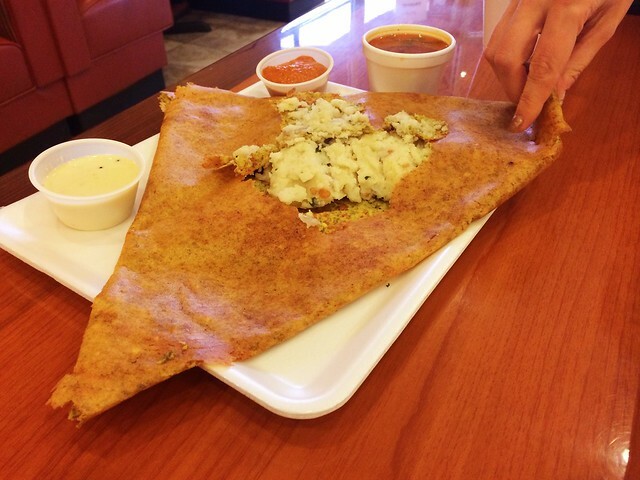 We destroyed it quickly, while the dosa was still crisp. 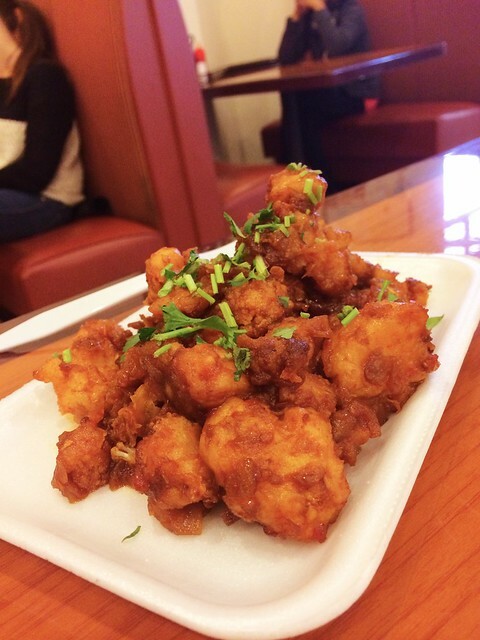 On the side we had a heaping dish of gobi manchurian, fried perfectly, nice and spicy and a little sweet. This is one of my favorite Indo-Chinese dishes anywhere. 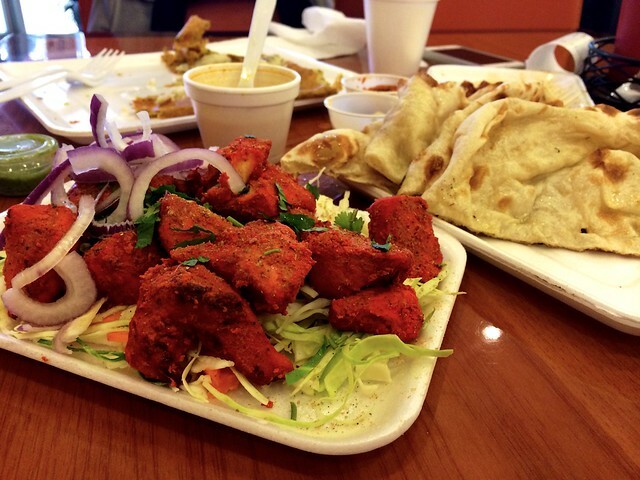 Lastly, a dish of chicken tikka kebab. I don't know if this is just our luck, but generally we've been happier with the vegetarian dishes we've ordered at Hot Breads. The chicken was pretty dry, but wrapping it in a little naan with some chutney and a sliver of onions improved things a bit. We ended up taking most of it home, where Logan turned it into a weeknight curry. The people that run Hot Breads have been generally quite nice to us. When we were there, a young couple was having trouble calming their unhappy baby, and the manager brought out a free slice of cake for him. Often, there's terrific Bollywood dance numbers on the TV, too. A little ambience for the customers. Over the last few months, Hot Breads has become one of our weekend go-tos, even though they're a good 20 minute drive from us. This is due to the strength of their dosas, idli, and Indo-Chinese food, but we're happy with each visit to branch out a bit further onto other parts of their quite large menu. We'll definitely be back, perhaps this weekend. Their website says they're super proud of their baked goods, but we've never tried them. Hot Breads is at 7318 McNeil Drive in northwest Austin. (512) 249-9109. Family and friends said goodbye to our cousin Liz today in Tallahassee, Florida. Liz was the wife of Logan's cousin, Dusty. She was born and raised in Chicagoland (like me), moved to the South for college (like me), met a charismatic Southern man (like me), and decided to remain in the South (like me). They were married in 2004 (like us). They had two completely charming little blonde daughters, and Liz went back to graduate school. Logan and I were only lucky enough to meet Liz a few times, at family gatherings, but she was always so kind and sweet, and such a terrific mother to her girls. Liz was diagnosed with cancer a couple of years ago, but with chemo and radiation treatment she went into remission. She finished up her graduate degree last year, right at the time the cancer returned with a vengeance. A course of invasive and very difficult treatments were enough to hold the cancer at bay, but only for a few months. Cancer is such an evil disease. During the course of her illness, Liz's family set up a Facebook page for updates. They are currently planning benefits for the family to help defray the cost of medical care. They've also been keeping people updated through a Meal Train site, for people that aren't on Facebook. I'm sorry we didn't live closer to you, Liz and Dusty. I'm sorry we didn't get to know Liz better. We will help to keep her memory alive and support you and the girls as your family and friends. We love you. When we were in Louisiana in December, it was actually COLD. This was refreshing, as some holiday seasons it's downright balmy there, which makes it difficult to sit in front of the fireplace enjoying a nice hot cup of cocoa. (PITY US.) A couple of nights before Christmas, we all bundled up in our warm clothes and hopped in the car to check out Celebration in the Oaks. 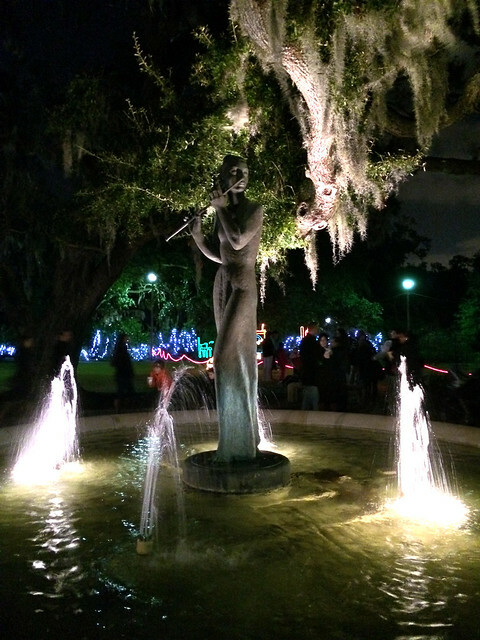 Celebration in the Oaks is a yearly lights festival that takes up acres and acres of City Park. Logan and I had never been before and were super excited to take in some holiday cheer! First things first, though. We had to marshall our resources by eating burgers bigger than our heads at Port of Call. Port of Call is a hilarious dive bar/steakhouse that serves some of New Orleans's favorite burgers. It's often packed, but we were lucky enough to immediately get a table for our party of 7 (at the only table that could have accomodated us). The place is dark and festooned with weird island accountrements. The burgers are enormous and good. They're served with a baked potato rather than fries because the kitchen doesn't have a deep fryer. Stuffed and fortified, we all headed back to City Park. The park that night was beautiful and there was so much to look at! A huge Christmas tree made out of poinsettias; a Cajun Night Before Chrismas light show; a hothouse full of ferns; dinosaur lights; an enormous model train set; and on and on and on. We waited in line to take the little train around the grounds. If you do go to the light show, and you want to take the train, GET THERE AND GET IN LINE EARLY. The line got ridiculously long later on. While we waited, we took some pics with the Ferris Wheel in the background. I got a nice shot with Logan's folks, his brother, and our nephew. The train was cute, but open to the elements, and thus very cold. And romantic. Then, we toddled over to the carousel, which is outfitted with gorgeous antique riding animals. While we waited, we plotted which ones we'd ride. This kid cracked us up. Hiyo, Silver! He held his hand like that the ENTIRE TIME. Perhaps he'd only ever seen a bronco buster and was afraid the wooden horse might start bucking? Kids on giraffes are cute, even if they don't look particularly impressed. Then, finally, it was our turn! They don't tell you how downright scary it can be, riding a lion. GQ was, as ever, the brave patriarch. He took one for the team and protected us all. Logan and I snagged horses that went up and down, because we are also very daring. I hadn't been on a carousel in years, and totally loved the nostalgic fun of the whole thing. Grins abound! Also, to people who had trouble commenting on the blog yesterday, I'm sorry. I can't imagine what's going on. Clearly, this is another reason for me to migrate the blog from Typepad to somewhere not-typepad. Sigh.